Access: See Fig.1 and Table 2. · Telephone the Marina Office approximately half an hour before your arrival. Marina staff may meet you and guide you in by boat. (except on Wednesday). · Do not try to navigate the access at night as it is dangerous. · Berths: Boats up to 15m (50ft) LOA and up to 4m draft can be accommodated. · Hall Out: Boats up to 13.5m (45ft) LOA (depending upon the bottom shape) can be hauled out. · Full Repair and Maintenance Services: The marina and local contractors provide a full range of services including mechanical, sail making, engine repair, refrigeration, bottom painting, electrical, instrumentation repairs etc. · Local transport: Upon request, Marina staff will drive you to a nearby super market, DIY store, or the public bus stop. · Loaner car: A free small loaner car is available. You must have and show your international driver’s license. The car may be borrowed for a maximum of one hour and distance is limited to travel to nearby Gokasho Town. · Available from 7:00 to 22:00 at no charge, but please take care not to waste water. · Available at the Marina. (Ask Marina staff). · Rubbish, separated into glass bottles, metal cans, PET bottles, and combustibles (waste foods, papers, plastics, etc.) may be placed in the appropriate recycle bins on the Marina dock. 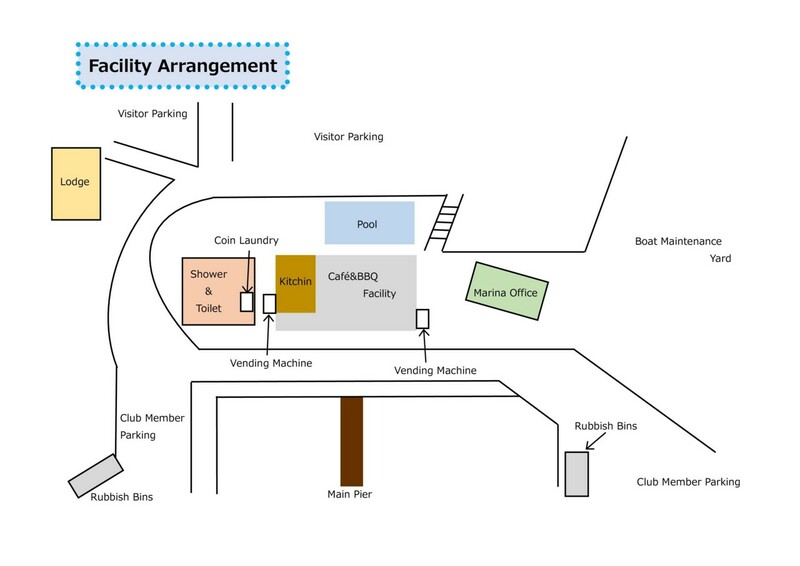 · Two coin operated washing machines and two clothes dryers are located near the entrance to the Shower and Toilet Building. The washing machine is 200yen per load and the dryer is 100yen for 30 minutes. Please make sure you rinse saltwater off your clothes with fresh water before using the washing machines. · The Marina will send and receive parcels for you. Please make arrangements with the staff at the Marina office. · Eight comfortable western style and four comfortable Japanese style rooms are available. Check in is 15:00 and check out 10:00. · Breakfast: Enjoy a morning set, 700yen. · Lunch: Enjoy noodle, pilaf, 500~800yen. · Dinner or BBQ, please ask Marina staff. · Drinks: Enjoy beer (500yen), and soft drinks. · Wi-fi is available free of charge. The service covers the Marina office and veranda restaurant area, or further depending your device. Ask the Marina staff for a password. · The berth fee covers the use of 100VAC, 60Hz, 15A Max power outlet and water tap located at each berth. Please try not to waste electricity or water. · Monohull Single Berth is 2000yen/day for the first three days for boats with a beam less than 5m, regardless of boat length. Boats with a beam greater than 5m are 3000yen/day. 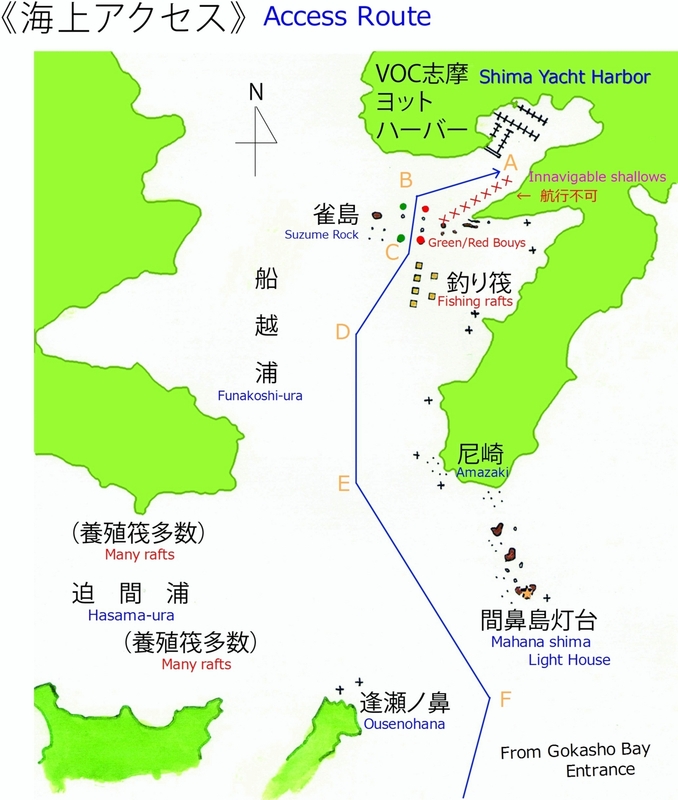 · Catamaran Single Berth is 4000yen/day for the first three days. Boats with a beam greater than 5m are 150%, and Catamarans are 200% of the prices shown in the table. · 5,000yen / person / night for visitors. · 3,500yen for VOC member’s guests. ports are Owase Port and Yokkaichi Port. Copyright © 株式会社　志摩ヨットハーバー. All Rights Reserved.